A book on Skee-Ball history? Researching the histories of amusement parks and roller coasters leads me down some strange roads. When I was doing my video for the early history of the Philadelphia Toboggan Company (PTC), I learned that they held the patent for and manufactured Skee-Ball machines for many years. I’d played these machines in arcades and at amusement parks growing up, but never thought of how intertwined they were with the amusement industry. 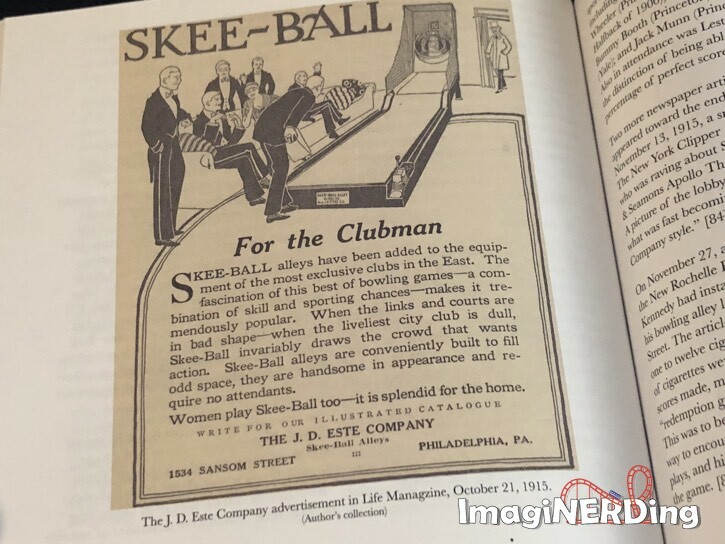 I never thought about looking into Skee-Ball history, did you? Out of the blue, Thaddeus Cooper contacted me after watching my video on PTC asking if I would be interested in reviewing his book, Seeking Redemption, about Skee-Ball history. Of course, I agreed. I couldn’t believe that someone wrote a book focusing solely on the game that ate so many of my quarters over the years. And all I got in exchange were tickets that I redeemed for trinkets and prizes. The book completely surprised me when it arrived. The book is 433 pages and measures 8.5″ x 8.5″ x 1.5″. Yes, it’s an inch and a half thick. I can’t believe there is this much written about Skee-Ball! Sixteen chapters tell the history of Skee-Ball and it’s not as straight-forward as you might think. 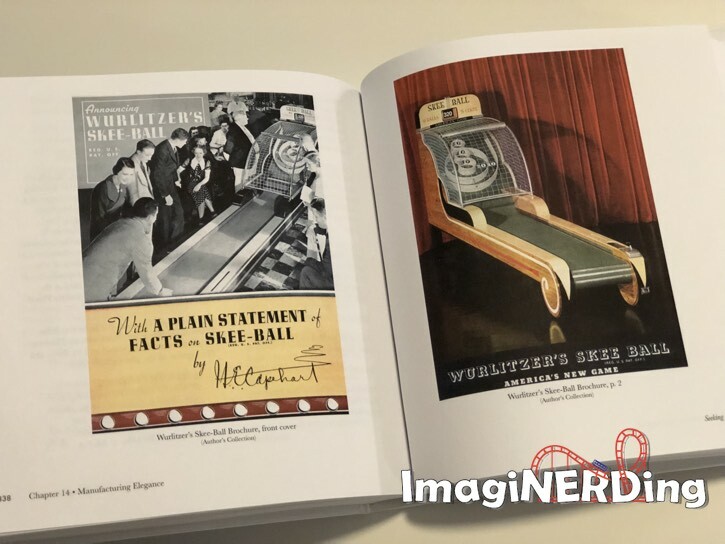 Thaddeus and Kevin delve deep into the archives of the Vineland Historical and Antiquarian Society and Philadelphia Toboggan Coasters, Inc., to unearth information that had never been published before. The story of Skee-Ball is as much the story of the American amusement industry, capitalism and modern ingenuity. Filled with full-color (when available) reproductions of patents, articles, advertisements, correspondence and hand-written notices, Seeking Redemption is a treasure! The book quickly dispels a few urban myths about the origins of Skee-Ball based on earlier articles. The authors trace the invention of Skee-Ball to the hapless John Fourestier Simpson; his life story parallels the ups-and-downs of Skee-Ball. Thaddeus and Kevin invested time and effort into crafting the story of Skee-Ball through illustrations, letters, patents, correspondence, advertisements, hand-written notes and other pieces of ephemera. The book is a historian’s dream. We follow the tribulations of Simpson and his creation as it travels from manufacturer to manufacturer trying to find a toe-hold. With each new person introduced into the tale, Skee-Ball takes one more step into the limelight. At some points, you know that the game is just going to break big, and sometimes it does, while other times it misses the mark. It is really hard to believe that something as prevalent as Skee-Ball simply wasn’t always there. Through sixteen chapters, we meet the people that shaped and championed Skee-Ball into what it is today; from a simple idea for a new amusement to a digital recreation of an arcade favorite. 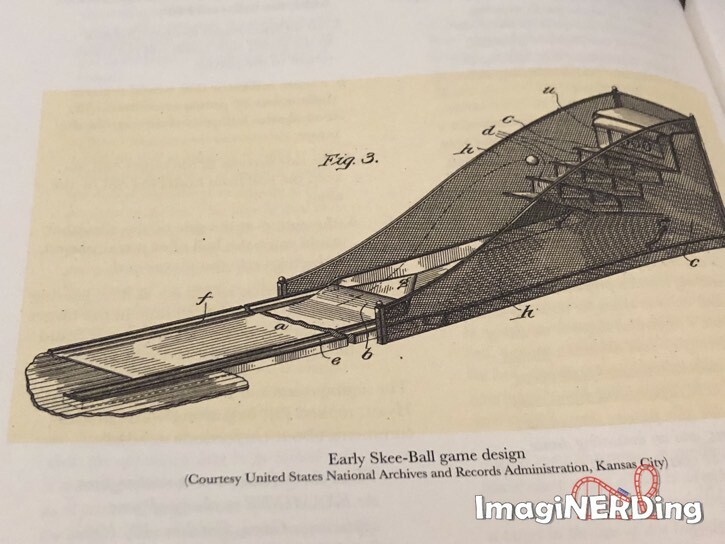 Why Should I Buy a Book on Skee-Ball History? 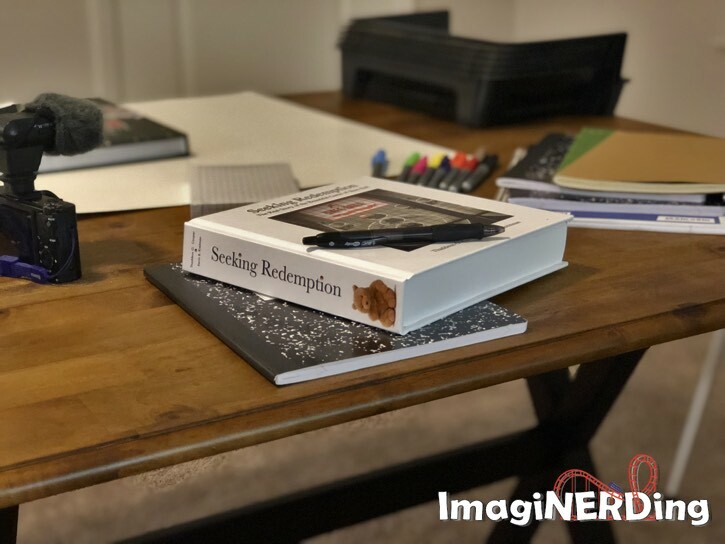 Seeking Redemption is more than just a book about the history of Skee-Ball. Thaddeus and Kevin mirror the story of the amusement industry and weave the development of modern capitalism into the history. We meet the influential characters and places that define the modern amusement park and entertainment industry. The book’s biggest strength is also it’s biggest weakness: its sheer size and the attention to detail. The authors included everything imaginable, including reproducing hand-written notes and letters. The amount of supporting documentation is amazing and overwhelming. Future historians are going to praise Thaddeus and Kevin for the presentation and scope. General fans of Skee-Ball might find themselves getting mired in the amount of detail presented, but the history is well worth the time. There were times I couldn’t put the book down and there were times I had to skim pages of patent applications. Still, the pacing is brisk and there are immeasurable ah-ha moments. Seeking Redemption: The Real Story of the Beautiful Game of Skee-Ball is a book that I whole-heartedly recommend. I’ve never read a book dedicated to an amusement device that is so replete with anecdotes, ephemera and archival information. The authors should be lauded for their attention to detail and their tenacity in seeing this project through. I spoke to Thaddeus on several occasions and he mentioned that the book was five years of researching and a year to write. When is the last time you spent six years on a project? Are You Going to Pick Up Seeking Redemption? Special thanks to Wes B. for supporting me on Patreon!